I was never a big fan of brussels sprouts until I tasted my friend Nicole’s sautéed recipe. She shreds them first and then sautés them in garlic and oil which really allows the seasoning to flavor every bite. This would make a nice Thanksgiving side dish. I added some diced shallots along with the garlic and really enjoyed these. Give this method a try if you don’t care for brussels sprouts, you might be pleasantly surprised like I was! I was never a big fan of brussels sprouts until I tasted my friend Nicole’s sautéed recipe. She shreds them first and then sautés them in garlic and oil which really allows the seasoning to flavor every bite. This would make a nice Thanksgiving side dish. I added some diced shallots along with the garlic and really enjoyed these. In a sauté pan, heat olive oil. Add shallots and sauté about 2 minutes, add garlic and saute until golden. I liked these but didn’t find them to be anything special, I would definitely add bacon or pancetta in the future. You were right, these are the BEST brussel sprouts out there! I never liked them until I tried these. My whole family finished them off really quickly! I had to give this recipe to my daughter in law and inlaws. I make something very similar to this and always serve at Thanksgiving (our Canadian one) and Christmas. My recipe includes a teaspoon of finely grated lemon zest and 1/2 cup of chopped crispy bacon. a great recipe to convert the Brussel-haters! Gina, how come the PP are 2 if there is 4 servings and you only use 1 tbsp of olive oil? Trader Joes sells brussel sprouts already shredded in a bag. I'm definitely going to try this! Thanks so much for the idea! I love Brussels Sprouts and this was a wonderful variation. BF loved them, and he couldn't tell what they were. He thought it was cabbage! 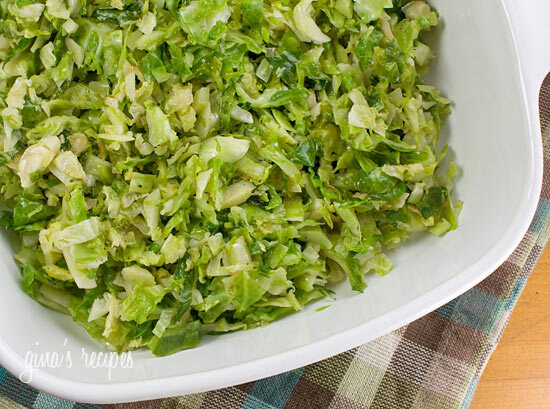 Silly question – how do you shred brussel sprouts? These are so wonderful. We buy the Trader Joes shredded brussel sprouts to make them even easier. how would you heat these up if you made them the day before? just microwave, pack into the skillet, etc? Had never had Brussels sprouts before but made these tonight and they were delicious! (To be fair, I am a veggie lover, but I know the preparation was important!) I had 1/2 pound of Brussels sprouts though and it made about 2 cups of shredded sprouts.. I notice the recipe calls for 1 pound and yields 2 cups so I was not sure how to count the nutrition info/serving size for mine. Hi Gina! I would be in the "i hate bussels sprouts club" 😀 but i tried these today and have to say they are pretty good. I still don't love them but to even eat them is a big step for me lol. My daughter (just over two) had hers mixed in with an egg. Just made these and yummmmmmmmmy! Plus I am noticing no odor in my house ( the kitchen smells gross when I boil Brussels!) . I sprinkled on some parm cheese too! Ok, last chance for Brussel Sprouts, I'm going to try this tonight! Thanks! LOVED these…. I like my sprouts more substantial so I kept them whole but halved them. This altered the cook time,and I felt like I needed a bit more oil (I just sprayed some cooking spray when it looked like the oil was soaked up). Also I think that I will be adding the shallots / garlic later… I added them in WITH the sprouts (not earlier) and they still seemed a bit overdone, I think this is because it takes longer to cook them when they're not shredded. And the Points Plus is HIGHER! I had two servings as a meal and it was 7 points. You have to use the builder because a lot of veggie points count (due to carbs, etc) when cooked. I just knew these would be good!!!! I personally have always loved brussel sprouts and am so happy to enjoy this simple and tasty version!!!! I also made the version with the pancetta and honestly can't decide which I like better!!!! Good goin' girl!!! Do you think I could make this in advance and heat them up for thanksgiving? I'm guessing they have points because when you put the ingredients into WW's recipe builder, it doesn't count veggies as 0 points…it takes all of their Nutritional Info and figures how many points they are, which in my opinion is dumb. So, do what I do…count just for the oil! I am not sure why this has points at all! I understand with a little olive oil, but it shoudln't be that much considering brussel sprouts have a zero points plus value. Anyone? I've never had brussel sprouts ever in my life…I always heard they were gross, so I never tried them. Well I just made these and they were wonderful!!!! Loved them! I added a little bit of red pepper flake to the garlic and shallot and a squeeze of lemon at the end and they were fabulous! Thanks! WW recipe builder shows 3, but food calculator is 2. I was told that the food builder doesn't account for the 'free' items but it could reflect using nutritional values. These are great! I first tasted Brussels Sprouts this way when I made your penne with sausage and brussels sprouts. They were so good, I decided to use that as a side dish and then I saw you had it here as a side dish. Today for lunch I did this (no shallot though, just garlic, pam, S&P) and thew in a few chopped up asparagus spears and some left over grilled chicken. Super tasty lunch!!!! I can totally seeing us doing this as a light dinner with another side (plus the chicken). I served this dish twice at our dinner parties and got so much compliments. Thank you, Gina, for sharing your wonderful recipes! Anon- not sure why, I rechecked and I still get 2 pts plus. I love your blog. All your recipe's look so delicious that I can't decide which to try first. I am wondering why there is a difference in the Points Value that you post from the values given in the WW recipe builder? The value for the Sauteed Brussel Sprouts in the recepie builder is 3 points plus for 4 servings. What is the deal? Very very very delicious! My hubby was skeptical because he doesn't care for brussels sprouts so much, but he gave them a try and really liked them! My 5 year old not so much, but he did eventually eat them with little argument and said I could make them again (in a few weeks). Thank you for sharing your recipes! I have loved everything I have tried so far! Yes it sure is! I like it with pancetta too. Added some bacon (everything is better with Bacon) and it was a fantastic hit. I knew it would change the recipe values, but all in all it changed only slightly. This seemed to be the thing that sold my kids on brussel sprouts. Thanks! OMG. I love brussel sprouts to begin with, but these were phenomenal! Barely had any leftover to bring for lunch the following day! Definitely added to my list of side dishes. Thanks for yet ANOTHER great recipe, Gina! Another great recipe. My family loves this and when my 23 year old son has dinner with us he is always thrilled when I make these brussel sprouts. She helped me fix these, & we all LOVED them! I didn't have shallots, so I used regular onion and garlic. They certainly didn't have a bitter taste like I remember them having when I was a child. Delicious! Just recently found your 'site and am trying these babies tonight. Don't tell the kids. Do u know the points plus for this recipe? I made it once before the switch and have craved it ever since! Making it tonight, but need to know how many points plus? OR fat, carbs, fiber, protein? THANK YOU! 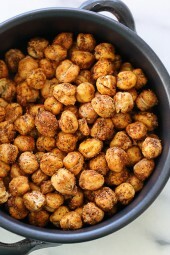 I'm soo happy you liked them, I just bought some this week to post a new recipe! Don't ask me why, but I decided to make this first from your recipes….but guess what? I loved it! I am SOOOOO glad to find your site. I just joined WW, and your site is going to be a lifesaver! In pre diet days I would add crispy bacon which is amazing. Might have to try it without this time round! 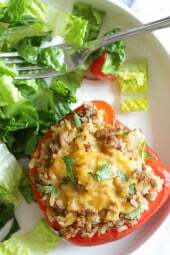 Just found this website, hubby and I are now doing the weight watcher diet and we are so surprised of the wonderful things we can still eat. Just have to change a few ingredients and portion size. Thank you Gina, LOVE the website. I made these yesterday and got to enjoy them for lunch and dinner again today! LOVED the flavor. I did add a little water when I was cooking them because I was afraid they'd burn. I'll be making these again soon. Yet another great recipe from this site. Thanks!! I didn't have a problem with it burning, I cooked it on low. My pan is pretty thick so the heat is distributed pretty evenly. I made these yesterday. I doubled the recipe because 1 lb. just didn't look like it would be 4 cups. I was wrong and put the rest in the freezer. I did have to cook longer because I wanted them to be softer. I also had to add about a cup of chicken stock because I was afraid they would burn without some liquid. Did anyone else have that problem. Am having a blast trying new recipes. Gina, you rock girl! this sounds SO good!! i love brussel sprouts!! i only ever buy frozen so i think i would have to use a chopper to get them all shredded up, it's worth a try!! Is this recipe only for fresh brussel sprouts or does it work for frozen and then thawed sprouts? Thank you! Glad you liked it, now if only I can convince my husband to eat brussel sprouts! Made this last night and it's a great alternative to whole brussel sprouts. Loved the garlic! 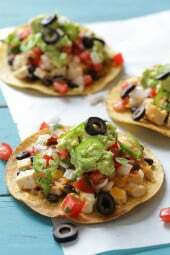 Gina, you have the BEST WW recipe site!! Thank you so much for all of your time, expertise, and sharing your delicious recipes! You're absolutely wonderful!! I made this tonight and it was so good. I dont think I will have brussel sprouts any other way now! I have been trying to make one recipe of yours a week I never tried fresh garlic until now because alot of your recipes call for it so I am getting better at it. Thank you for the great recipes Gina! LOL, that's ok!! At least you tried! Sorry Gina…I tried and I tried hard…I just don't like the taste of brussel sprouts…even this recipe couldn't trick me. Oh well next time…but all your other recipes have been spot on!!! Gina, this was a delicious recipe and I have made so many of your other recipes—one is better than the next! Thank you SO much for putting all of these for us to share! Just made these for dinner tonight. YUM! I have your blog bookmarked for more of your wonderful ideas. Thank you!! To print recipe only highlight the recipe click copy then print when window open click selection and then click print. I hope that this helps. LOL, most people are skeptical about brussel sprouts. Glad they liked them, I love them like this! My family was skeptical about this but it turned out great and they gobbled the brussel sprouts right up. Thanks for sharing. Glad you all liked the recipe. To print without comments, just print page 1.
wish we could print without all the comments. good recipes! 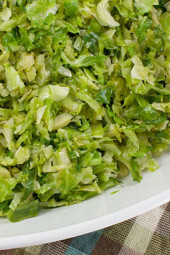 Hi Gina: I tried the Sauted Brussel Sprouts for supper and they were absolutely great! This is the only way we ever make Brussel Sprouts. I usually squeeze some lime juice over the top of them too. I grow Brussel Sprouts in my garden, shred them with my food processor blanch them for 2 min in boiling water and freeze in Ziploc bags. They can just be sauteed for a quick fresh vegi all winter long! This was delicious. Definitely a repeat in my kitchen. leftover, so for lunch I am going to toss some halved grape tomatoes in them. Yum! Thanks for sharing your wonderful recipes. There was just an article in real simple that discussed fall veggies and brussels were on the list. I'm going to try this one on Saturday! Oh, my gosh, what a great idea! Love it! Just had brussel sprouts last night and they were giant ones, really too big for my taste, but they would have been perfect in this recipe. Might have to send hubbie out for another bag and try this tomorrow! That is a fantastic idea! I think it would go over with the family a lot better, too! You can, but I just used a knife. do you use a grater to shred them? this looks like a nice change from whole brussles!